Myracle, Lauren. 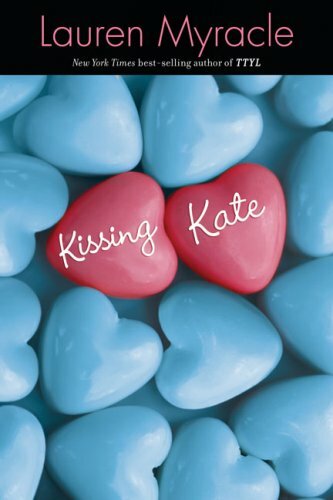 Kissing Kate. New York: Penguin Group, 2003. Kate and Lissa shared a kiss at a party over the summer. Kate was drunk at the time, and now she is humiliated and won't speak with Lissa. Lissa doesn't understand why Kate won't speak with her anymore or why she is so insistent that the kiss was a complete accident. As Lissa struggles to come to terms with herself and her sexuality, she also is struggling with her friendships, both with Kate and with her new friend Ariel. This book was a very quick read, and like many of the books published by Penguin's imprint Speak, dealt with a major teen issue: sexuality. I didn't find this book to be as definitive or essential as the other works of fiction I have read. It was worth the read, but probably would be better checked out of a library than purchased at a bookstore. 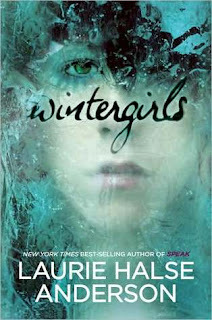 Anderson, Laurie Halse. Wintergirls. New York: Penguin Group, 2009. Lia and Cassie are competing to see who will be the thinnest girl. Cassie learned to binge and purge at a summer camp, and Lia began counting calories after her ballet teacher suggested she stop eating so much ice cream. At the beginning of this novel, Cassie loses her life, and Lia struggles with grief over the loss of her friend, guilt over what she could have done differently, and visions of Cassie's ghost who keeps encouraging Lia to end it all. Lia doesn't want to go back into residential treatment, but her parents don't know how to help her anymore. Lia needs to choose whether to be brave and open herself to getting help or to continue to listen to Cassie's ghost. I absolutely love Anderson's book Speak, so I was happy to see another of her novels. I'm not super-familiar with the trauma and struggles of those with eating disorders, so it was a bit odd for me to be trapped inside Lia's head, so to speak, as I read through this book. I was glad for the decisions she made toward the end of the novel, and I think Anderson has once again captured the mind of a teen girl who is dealing with problems larger than she can handle on her own. Anderson, M. T. Feed. Somerville, MA: Candlewick Press, 2002. 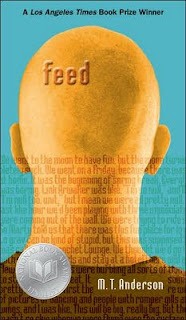 In a futuristic world, all people are equipped with "feeds" that download information directly into their brains. Titus, the protagonist, meets a girl who is trying to fight against her feed, and this girl changes his life. At least, this is what the book should be about. I don't know because I couldn't get past the weird vocabulary. I've read dozens of fantasy novels, each with its own special vocabulary, but in each of those cases the special vocabulary was introduced gradually with plenty of in-text synonyms and support. This novel contains neither of those things, and the new vocabulary was frustrating and irritating. I tried, really I did, but I couldn't finish this book. Shepard, Judy. The Meaning of Matthew. New York: Penguin Group, 2009. In 1998 Matthew Shepard was taken out of the Wyoming town where he lived, tied to a fence post, savagely beaten, and left for dead, all because he was gay. He struggled for life in a hospital bed, but succombed to his injuries and died a few days later. This incident became the defining incident regarding violence against members of the GLBT community. 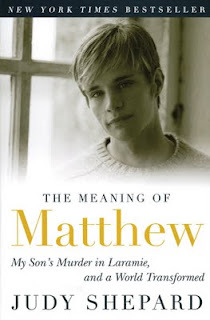 In this book, Matthew's mother Judy describes Matthew's childhood as well as his coming out to his family as gay. 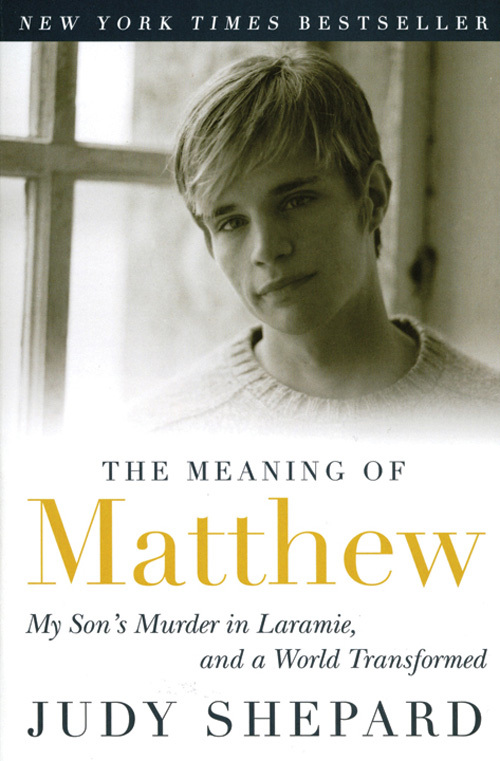 She details the court procedings after Matthew's death and her work with the Matthew Shepard foundation. This is not an easy book to read, but it was definitely worth the time I spent on it. Stirling, S.M. Conquistador. New York: Putnam, 2003. What if Columbus had never reached North America? What if white man never touched these shores? How would our continent be different? 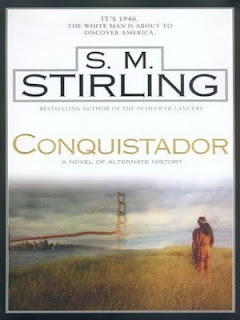 Stirling explores this concept in his novel as one man in California discovers a portal in his basement. This portal opens to a North America that has never been touched by settlers. This portal is soon used to the best advantage: those who enter the portal live lives of oppulence beyond the gate, only returning to "the real world" to do business or gather supplies. They carefully guard the secret of the gate, knowing the consequences of discovery would be significant. This book is a fascinating page-turner. I truly enjoyed the entire story and found the ending to be both surprising and satisfying. Angleberger, Tom. 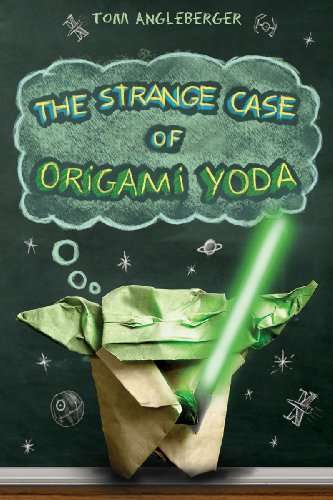 The Strange Case of Origami Yoda. New York: Amulet Books, 2010. Dwight is one of the weird kids in his class. A lot of his quirks have convinced his classmates that he must be from another planet. However, one day Dwight brings an origami Yoda to school, and Yoda starts giving advice to his classmates, advice that Dwight himself could not have come up with. So where does Yoda get his great ideas, and why won't Dwight follow the advice of his paper puppet friend? I absolutely loved this book. I generally enjoy books with middle schoolers as main characters, but this one tops many of the others I've read before. This one was laugh-out-loud funny. If I still had a classroom, I'd read this book aloud to my students. Schmidt, Gary. 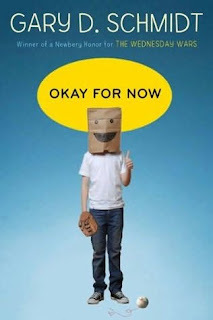 Okay for Now. New York: Clarion Books, 2011. Doug Swieteck was featured in Schmidt's previous book The Wednesday Wars, a book which I read to my seventh graders every year while I was teaching. I was excited to see another book by this author and another book about these characters. 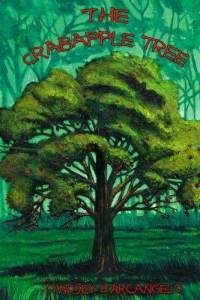 Doug and his family have moved from New York to the middle of nowhere, and Doug is having difficulty adjusting to life in a small town. Slowly, though, he begins to make friends and to make right choices, even if they aren't always easy ones. And of course this book also happens to feature a librarian who makes a difference, which is always a good theme for a future librarian. 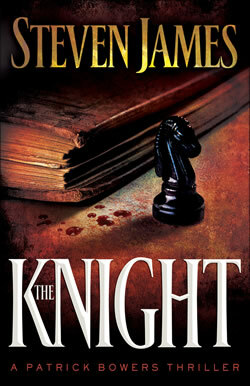 If you haven't read Wednesday Wars, read that first, then pick up this one. You'll thank me later. Bell, Rob. Love Wins. New York: Harper One, 2011. This book title has been floating around in forums and on blogs for a while, but it wasn't until just recently that I was able to pick up a copy and read it. The author's idea is a simple one: evangelical Christians are taught that God is offering us eternal life, provided that we accept that gift in the way He offers it. If not, if we do not pray the right prayer or don't pray it at the right time or don't say the right words, then we are condemned to hell. 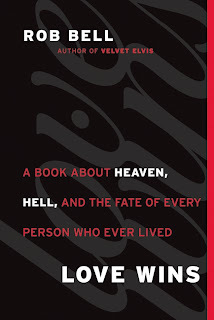 This means that lots of people throughout history are going to hell, while very few people will go to heaven. Many both within and outside the Christian community have difficulty swallowing this truth. How could a good, loving God condemn people to hell? Bell posits the possibility that perhaps God will allow all those other people, those who weren't ready for salvation on Earth, a second chance at salvation. I'm not going to jump on the "Love Wins" bandwagon and say that I agree wholeheartedly with Bell's theories. But his book was definitely an interesting read and caused me to view the concept of salvation from another point of view. Dugard, Jaycee. A Stolen Life. New York: Simon and Schuster, 2011. 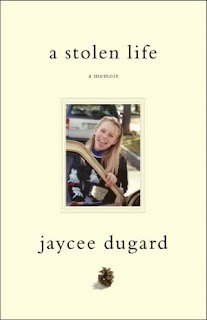 When Jaycee Dugard was eleven years old, she was kidnapped on the way to school. The man who kidnapped her kept her at his house and sexually abused her for eighteen years. She gave birth to her first child at fourteen. When she was nearly thirty years old, she was discovered and reunited with her family again. This book details her captivity. This was not an easy book to read, but I am glad that Jaycee is strong enough and brave enough to tell her story, and I wish her all the best as she and her daughters recover. Marcus, Eric. Is It A Choice? New York: Harper Collins, 2005. This book reads like the FAQ page of a website, listing questions in bold with their answers underneath. I skimmed this book rather than read it, because I either already knew the answers to some of the questions or simply wasn't interested in the answers. 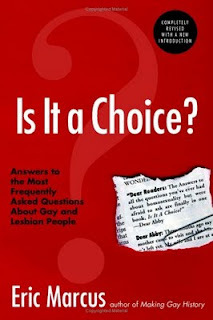 This book is an excellent resource for a person who knows someone struggling with homosexuality. Chellew-Hodge, Candace. 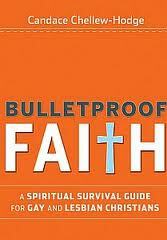 Bulletproof Faith. San Francisco: Jossey-Bass, 2008. 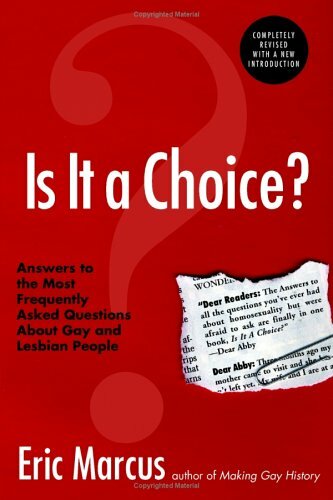 This book is intended for gay Christians who are attempting to defend both their faith and their orientation, or rather their right to their faith regardless of their orientation. I found the information in this book, however, to be useful for all Christians when defending their faith. The suggestions in this book will help Christians to open up thoughtful, friendly dialogue with those around them without compromising what they believe. It is completely possible to agree to disagree with someone and to continue to have an honest and interesting conversation without arguing or becoming angry. After spending many years in an environment where the "I'm right, you're wrong, and I must change your mind so you agree with me" mindset is rampant, I found this book to be refreshing and eye-opening. Thoughtful dialogue will bring more people to an expanded outlook than disgruntled debate ever will. Goobie, Beth. Hello, Groin. Custer, WA: Orca Book Publishers, 2006. Dylan has been coasting along in school just fine. She is not a popular girl, but she is not ridiculed either, and she has discovered how to ride the waves of high school social drama without standing out either way. That is, until she helps create a bulletin board for the school library. Her display is censored by the principal and soon Dylan is the talk of the school. What did the principal ask her to remove, and why is Dylan being so secretive about it? Dylan wrestles with the social demons as she seeks to discover why she made the board that way in the first place and what message she wanted to convey. 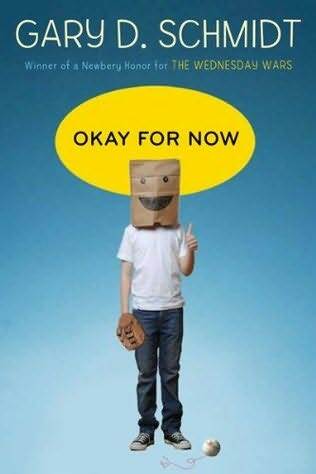 This was an interesting book. I always enjoy stories that mention other stories, as that seems to be an easy way for me to add to my "must-read" list. Dylan's moodiness got on my nerves at times, I will admit, but it got on other character's nerves, too, so perhaps I was supposed to be annoyed. I was quite impressed with Dylan's parents and their ability to walk the fine line between encouraging proper behavior in their daughter and also accepting her for who she is and who she is choosing to become. When necessary, Dylan's parents allowed her to face the consequences of her actions, but they also stood up for her when they thought she had done the right thing. D'Arcangelo, Lyndsey. The Crabapple Tree. Alpha World Press, 2009. Busy Wheeler is leaving for the summer. Her best and only friend Billy will be left behind as Busy spends the summer with her aunt as her parents hope that her attitude will improve. The summer is a hectic one for Busy as she works at her aunt's bed and breakfast and discovers some things about her family and about herself. This story was cute and interesting and entertaining as well. I enjoyed meeting Busy: I was impressed with her defense of Billy and I applauded her courage in facing some new information about her birth mother. The plot twist (which I will not reveal here, lest I spoil the book for you) was not what I expected, but still made for interesting reading. Ferrante, Tony and Paulette Jacobson. 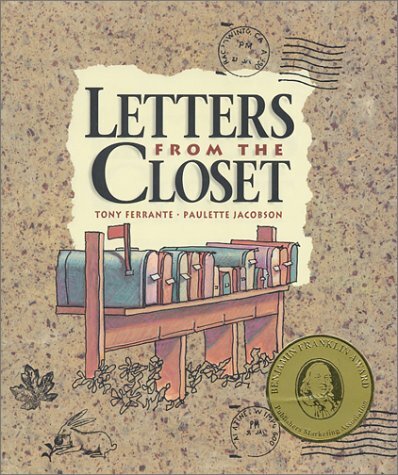 Letters from the Closet. Sacramento: Tzedakah Publications, 1994. 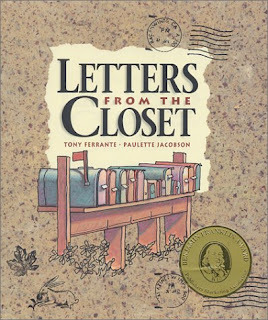 With pull-out post cards and colorful illustrations, Letters from the Closet looks a lot like a children's book, but it's more like a children's book for grown-ups. This book is a fictional compilation of letters and postcards between two friends as their lives drift apart and then back together again. I thought this book was beautiful, and I will probably be adding a copy to my own bookshelf at some point.